Clocks demonstrates using a ListView type to display data generated by a ListModel. The delegate used by the model is specified as a custom QML type that is specified in the Clock.qml file. List elements are defined like other QML types except that they contain a collection of role definitions instead of properties. Roles both define how the data is accessed and include the data itself. For each list element, we use the cityName role to specify the name of a city and the timeShift role to specify a time zone as a positive or negative offset from UTC (coordinated universal time). We use the opacity property to hide the arrows when the list view is located at the beginning or end of the x axis. 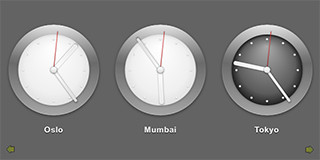 A Rotation transform applied to Image types provides a way to rotate the clock hands. The origin property holds the point that stays fixed relative to the parent as the rest of the item rotates. The angle property determines the angle to rotate the hands in degrees clockwise. We use a Behavior type on the angle property to apply a SpringAnimation when the time changes. The spring and damping properties enable the spring-like motion of the clock hands, and a modulus of 360 makes the animation target values wrap around at a full circle.